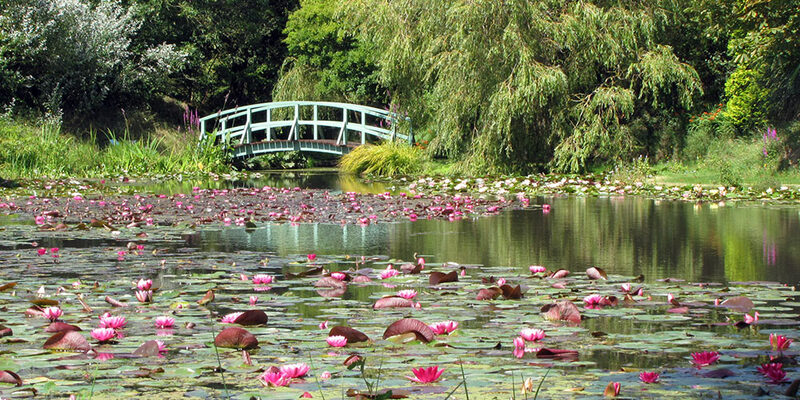 8 acres of gardens with National Plant Collection of Water Lilies on display during summer months. Museum, Cafe, Gift Shop and Plant Sales. We are situated 2 miles from Weymouth Harbour on the B3157 to Bridport. Follow the brown road signs for 'Water Gardens' from the A354. There are good road links to the attraction. We look forward to welcoming you. If you have any queries or require any assistance please phone 01305 785150 or email info@bennettswatergardens.com. The nearest railway station is Weymouth, which is 2 miles away. Taxi's are available from Weymouth train station. The nearest bus stops are 0.5km (1/3 mile) from our main entrance at Budmouth School (N)/The Alex (S). There is a shelter and seating. Take either the Weymouth to Chickerell bus (Service 8) from Weymouth Town Centre or the Jurassic Coast bus (Service X53) between Axminster, Bridport & Weymouth. Directions: Walk west on Chickerell Rd and turn onto Alexandra Rd, take the footpath through the small green onto Putton Ln, cross Chickerell Link Rd/B3157 onto Putton Ln, we are on the left. The main road outside the attraction has a wide paved path on one side. There is parking on site for 50 cars, 2 coaches and 2 clearly marked Blue Badge parking spaces, which are 2m from the main entrance. The on site car park surface is compacted gravel with a paved path leading to the main entrance. There is a drop off point at the main entrance. The main entrance double doors can be opened to a maximum width of 1.5m. The main entrance and ticket area is situated on the ground floor with step free, level access, throughout. The floor surface is tiled and paved. There is a lowered section of the welcome/ticketing desk. There is partial wheelchair access available around the gardens. A map is provided and directional signs are located at relevant places. The museum interpretation boards are all in large text, and have pictorial representation where applicable. These toilets have a unisex accessible toilet. A light, easy open door 900mm/35.5ins wide. 980mm/38.5ins transfer space to the left of the ground floor toilet, when facing the toilet. There are vertical rails either side of toilet. The toilets are well lit with automatic fluorescent tube overhead lighting. The café is situated on the ground floor with step free level access from the entrance. The entrance to the café has double doors which can be opened to a maximum width of 1.5m. Tables in the restaurant and café are well spaced apart, with a clear height from the floor of 609mm/24ins, with upright chairs without arms. Lighting in all areas is natural daylight with overhead lighting used. The flooring in the café is carpet. Where possible all our food produce is locally or regionally sourced. We do our best to cater for any dietary requirements; please contact us in advance to check any specific requests you may have. The cafe is self-service, however, staff can assist on request. The nearest public toilet with an accessible WC is located near the main entrance approximately 7 metres from the café. There is a shop with a range of souvenirs and gifts, and also plants sale, which can be accessed directly from the main entrance/ticketing area and when exiting the gardens. There is background music playing. The gardens have grass pathways with gradual inclines and smaller walkways covered with loose gravel. There is a picnic area on a level lawn with picnic benches. Main pathways are 3 metres wide. Some pathways can be uneven underfoot. There are wooden benches at regular intervals around the garden. During periods of sustained wet weather the gardens are closed to wheelchair users. We are planning a review of our website and brochure next year to make it more accessible, your comments are welcome to assist us with this project. 31st March to 27th September 2019, Sunday to Friday, 10am to 4pm.